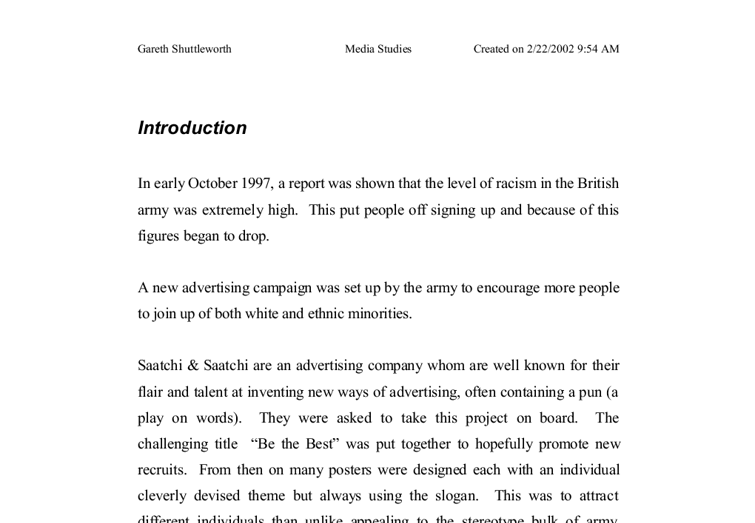 Introduction In early October 1997, a report was shown that the level of racism in the British army was extremely high. This put people off signing up and because of this figures began to drop. A new advertising campaign was set up by the army to encourage more people to join up of both white and ethnic minorities. Saatchi & Saatchi are an advertising company whom are well known for their flair and talent at inventing new ways of advertising, often containing a pun (a play on words). They were asked to take this project on board. The challenging title "Be the Best" was put together to hopefully promote new recruits. From then on many posters were designed each with an individual cleverly devised theme but always using the slogan. This was to attract different individuals than unlike appealing to the stereotype bulk of army recruits as before. Section 1. Poster 1. Slogan -" Wanted 17 year olds into body building" This Pun is mainly aimed at 17 year school leavers, its catchy play on words attracts younger people into firstly looking at the poster. The title is good and contrasts well with its caption. Presentation layout The posters layout is well thought out using all the advertising space, it enhances the slogan/title by using white bold text on a dark background which immediately catches the eye of the public and therefore doing the precise job that it is supposed to. ...read more. Poster 3 Slogan - "17 Year old body pierces required" This out of the four posters has the strongest slogan, especially towards youths. It initially suggests that 17 years olds are wanted to body pierce which corresponds well with the image. Presentation/layout This poster again contains the same basic layout structure; the image shows a soldier vaccinating a young girl from a virus/disease, this sees to be in some distressed part and enhances the posters mean straight away. This poster is from a soldiers POV though his/her view is towards another soldier. Overall effectiveness This in my opinion is the best poster of the four, It has a strong message that is put across well. Its bold meaning can be fully understood any time unlike the others, its picture is also clear about what is going on. Poster 4 Slogan - "17 year olds needed to stop road rage" This posters slogan is also one of the stronger ones, it also as an initial suggestion which is that 17 year olds are needed to stop road rage, which is vehicles driving into one another usually due to some driving error made by a driver. The posters image changes this. Presentation/layout The poster once again is in the same style, the image shows a crowd of violent hooligans in the distance and a man quite close holding a baseball at in an aggressive manor. ...read more. If a different man saw the poster, say racists towards blacks, this may put him off joining the army. So overall, the poster works in good ways and it will encourage people of different backgrounds to join. Discuss in detail how the actors (es) who play Macbeth and L.Macbeth should prepaire for this scene. (Act 2 Scene 2) This scene is one of if not the most important and for me most interesting scene of all. Mainly because it's the main turning point in the play, I say this because in this scene, Duncan (the king of Scotland) is murdered; this changes the entire play as a loyal Thane (macbeth) betrays his country. This murder is not done as easily as thought to be however, and it takes a lot of persuasion from L.Macbeth to firstly convince Macbeth it's the right thing to do. Before any of this happens Macbeth meets three witches, they all tell him that he shall become thane of Cawdor also King! He dosn't take much note of it, until, later in the play he is premoted to 'Thane of Cawdor', which is the equivalent to becoming a Lord. This obviously changes Macbeth's state of mind, and in act 1 scene 7 the first sign of Jealous i displayed. Cawdor also Gareth Shuttleworth Media Studies Created on 22/02/2002 09:54 - 1 - ...read more. Newspapers and magazines, either through their own research staffs or through organizations employed for a fee, go to great lengths to analyze their circulations to show where their readers live, their income, education, recreational habits, age, and number of children and to provide other guides to determining their readers' susceptibility to certain classes of products. This has affected the non-alcoholic beverage industry in that many are switching to bottled water and diet colas instead of alcoholic beverages. * Time management has increased and is at nearly 43% of all households4. The need for bottled water and other convenient and healthy products are in important in the average day-to-day life. Convenience is the primary advantage offered by direct-response advertising. In recent years, a number of major companies have expanded their sales efforts to include direct-response. The popularity of direct-response is due in part to changing lifestyles. Trade Advertising All the articles in a store must be bought by someone before they are delivered to that store. This graph represents where people heard about Pamparama. From this graph it is clear that the main resource of advertisement that has been seen by the public is the Newspaper, this would be the Eastbourne Herald, Friday Ad and The Trade Catcher. This has clearly shown that is was a good idea of advertisement and has proved successful. According to Haan, Puffery is language used by marketers to describe their products and/or companies in advertising and sales presentations. 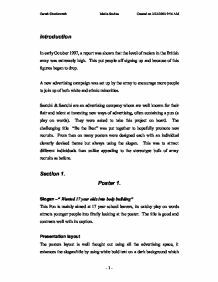 Puffery makes positive statements in advertising and sales about products that may or may not be true (Haan, 2004, http://64.233.167.104/search?q=cache:iR7buI4tYUoJ:www.cbfa.org/papers/2004conf/Haan.doc+puffery+in+Advertising+&hl=zh-CN [Accessed on 10 October, 2005]).